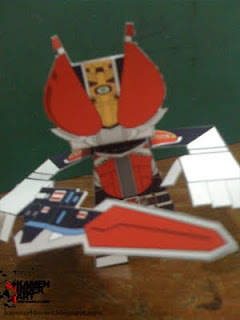 This paper toy is the Kamen Rider Den-O, based on the manga / anime Kamen Rider Series. The papercraft is created by Azrael. Kamen Rider Den-O is the primary protagonist and eponymous character of the 2007 Kamen Rider series, Kamen Rider Den-O. The name Den-O belongs to any of seven of the characters forming Kamen Rider Den-O, either by himself, as a combination of two characters or a melee of four or five.